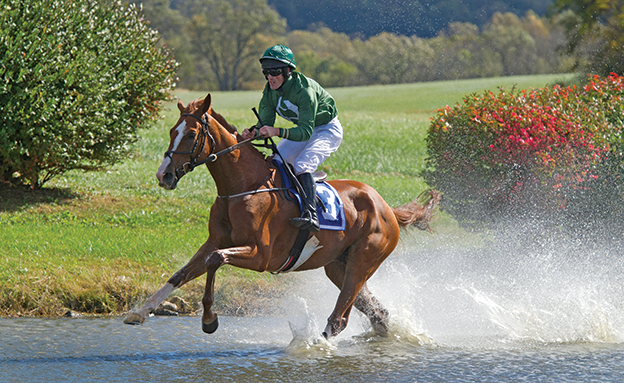 Many horses run in Piedmont steeplechases, but how many are true Piedmonters—bred from local sire and dam, born, raised, trained, and then raced in the Piedmont? Meet Zanclus, an eye-catching 17.1-hand chestnut Thoroughbred gelding (by Xenodon out of Jordani by Two Smart) owned and bred by Sara E. Collette of Pageland Farm in Casanova. Foaled on May 16, 2010, and raised by Collette and Cheryl Depriest at Pageland, he was put in training with Neil Morris, who is also Master of Orange County Hounds, at Hickory Tree Farm in Middleburg at the age of three and started racing at the age of four. Depriest adds, “Once he gets going … he has this incredibly long stride, so once he finds his rhythm, you know, the other horses are taking about a stride and a half to his one. He just covers an enormous amount of ground. He kind of jumps the same way, he’s big and it’s just like whatever you put in front of him, he just springs over. There’s no question about his clearing it and it looks like he puts forth no effort.” Zanclus’ stride, once he settles in, makes him an excellent contender in longer races. He’s very comfortable in the three-mile races, says Morris. 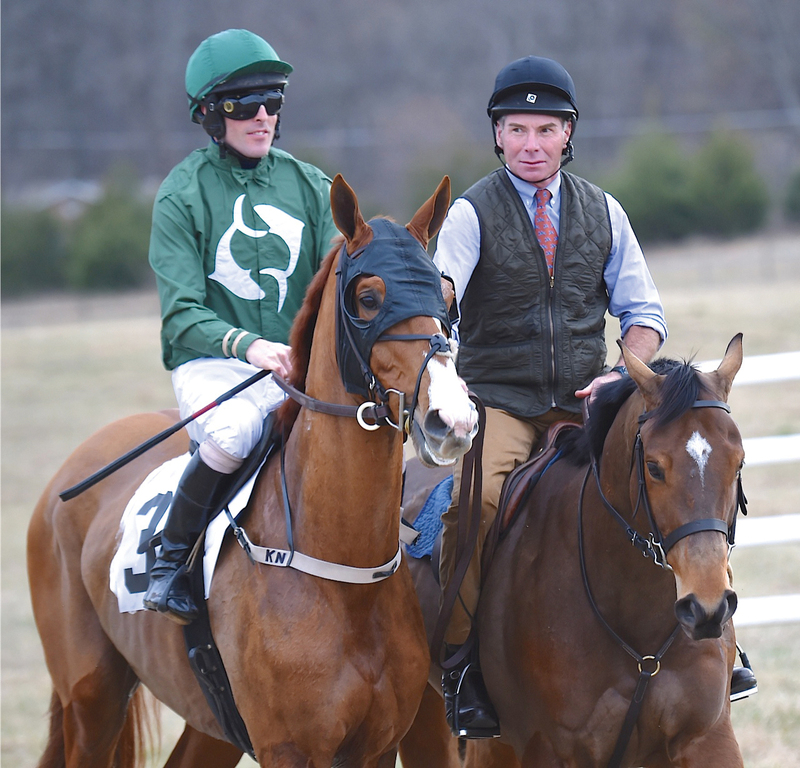 At the Oatlands Point-to-Point in 2016, Zanclus was the winner of the 3.5-mile William Corcoran Eustis Cup open timber race. 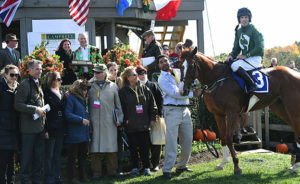 Winners’ Circle and presentation with Sara Collette, Neil R. Morris, Bruce Collette, and Kieran Norris. After a year off when they looked into selling him as a three-day event horse, Morris says, “We started running him over timber, and that’s when he really started to shine and show his greatness. He just needed a little maturity is all, he’s a great big horse but he was a late bloomer. Over timber is his forte and it came at a good time in his life because he was ready and mature enough. Foxhunting with me in the off-season really turned him around. It matured him, and another birthday helped him as well. He just needed a little more time. He’s a big striding horse and it really didn’t help him over hurdles at all. He has a very long elastic stride. That really stopped him being quick and efficient as a hurdle horse when he was younger. 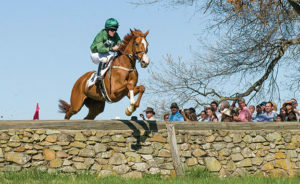 As a timber horse, it proves an advantage for him; just the way of his going getting across the country is very easy. He’s just a relentless horse, with a relentless gallop, and he’s very efficient getting over the jumps. He’s been extremely successful over timber. Extremely successful. He’s always a live horse in a race. He’s just a pleasure to take to the races; it’s nice to have that level of horse to enter a race with. 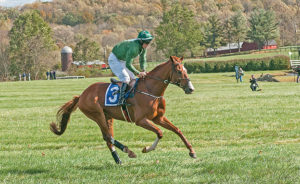 He’s got a lot of talent.” Zanclus started winning races in 2016, culminating in the Steeplethon Timber Steeplechase at the Great Meadow International Gold Cup. Zanclus with jockey Kieran Norris and trainer Neil Morris. Collette’s horses run under jockeys wearing green silks with white circling dolphins. Her husband is a fish zoologist and, he says, since he is funding the breeding program, he gets to name the horses. Hence, the horses are all named after fish. What’s in the future for Zanclus? After taking a year off due to an injury, his 2018 starts will include Orange County Hounds point to point, My Lady’s Manor, and Great Meadow, either as a Steeplethon or Gold Cup contender, depending on how his preliminary races go. According to Morris, “We want to make sure he’s back to where he was.” He concludes, “He’s a fine racehorse with a bright future, and hopefully he has plenty of years of racing ahead.” Look for him at the races this year, and cheer on our local homebred!